Albino 3: still with us... but for how long? 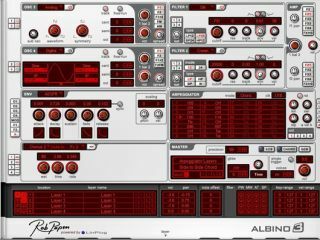 It may have been released almost six years ago, but LinPlug's Albino 3 remains a favourite plug-in synth for many electronic music producers. Indeed, you voted it at number 12 last year in our poll to find the best VST plug-in synths in the world today. It comes as something of a surprise, then, to learn that Albino 3 is going to be discontinued at the end of 2012. It's not clear exactly why this is, but a post on the KVR forum indicates that LinPlug has a new "classic subtractive synth" in the pipeline that will "accurately play back Albino 3 presets". However, this statement has been contradicted by Rob Papen in the same thread. He claims that the new synth won't load his 2100+ Albino 3 presets and that he will "never allow" his presets to work in the new product. There's further confusion surrounding the issue of support for Albino 3 once it's gone off sale. LinPlug states that it'll support it for "at least a year" (and offer a crossgrade option), while Papen claims that LinPlug has told him that it will be maintained for two years. Clear as mud, then, but what we can confirm is that Albino 3 remains on sale at the LinPlug website for €149.